Helmut Pottmann joined the Technical University of Vienna in 1986 as assistant professor. After visiting the Universities of Purdue and Kaiserslautern from 1989 to 1991, he became Associate professor in Mathematics in Hamburg and then full Professor in Vienna since 1992. He has also been Adjunct Professor at UC Davis since 1999. He was the founding director of the Center for Geometric Modeling and Scientific Visualization at KAUST, Saudi-Arabia from 2009 to 2013. Helmut Pottmann is probably best known as the founder of Architectural Geometry, a new research field at the interface of Mathematics, Computer Science, Structural Engineering and Architecture. He has launched and nurtured the bi-annual Symposium on Architectural Geometry, and has co-authored the seminal textbook on the subject. He is extremely well regarded not only in the graphics community, but also in architecture-related fields and has successfully transferred his research into architectural practice (including a number of internationally renowned architectural projects) and to the Evolute company that, since 2008, enables building projects featuring complex geometries by solving involved geometric problems. His research work combines mathematical depth and elegance, effective algorithmic solutions, and high practical relevance. Helmut has deep knowledge in all facets of geometry and an extraordinary skill to identify important connections between mathematical theory and applied problems in geometry processing and architectural design. Any of his papers includes new and non-trivial material, having being influential and having inspired new ideas. They are an example of synthesis among exemplary scope, magnitude of the scientific contributions, and clarity of the exposition. 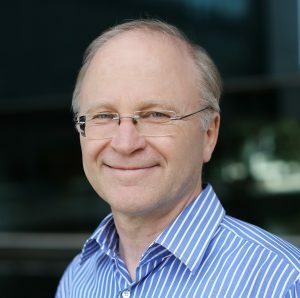 Helmut has also made significant contributions in Geometry Registration, Interactive Geometric Modelling, Freeform Surface Rationalization, and applications of Geometry in Manufacturing, and Robot Kinematics. His work has contributed to improve ICP registration between points and surfaces by using a locally quadratic approximation to the squared distance, with other key robust solutions to problems including parametric surface fitting and rigid registration. He has contributed new insights in the domain of discrete differential geometry and its application to discrete surface modelling. His work has opened up a whole new research area and inspired many to follow his lead. As a scientist, Helmut Pottmann always puts the highest standards on his work. His authorship is always a sign of significant scientific personal contribution in the project. He is able to find original solutions to problems in geometry processing which often are more elegant than heuristic approaches that have been applied before. He has helped to bridge the gap between significantly different research cultures in Maths/Computer Science and Architecture/Engineering. Helmut Pottmann was invited to give the 2017 Gauss Lectureship, annually awarded by the German Mathematical Society. Eurographics is extremely pleased to recognize Hetmut Pottmann with the 2018 Outstanding Technical Contributions Award.